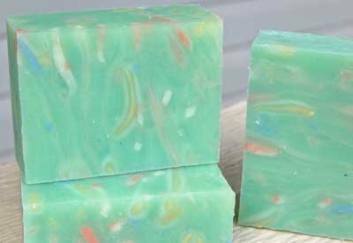 This homemade soap recipe uses brightly coloured soap bits to decorate the lovely green base and give it a fun 'confetti' style look. It's a great way to use up small soap scraps that are left over from other batches you have made. Essential oils of patchouli, lavender, rose geranium and sweet orange are used to give the soap a wonderful floral scent. The pretty mint green base is achieved using Hydrated Chromium Green Oxide and white mica. You can easily make this recipe Palm Free, by simply switching out the palm oil for lard, tallow, shea butter, cocoa butter or mango butter and re-running the recipe through a lye calculator to get the correct amount of sodium hydroxide (lye) needed. Distilled Water - 324 gr. | 11.43 oz. Lye - 123.48 gr. | 4.36 oz. To make this soap as shown in the picture, use the instructions for either cold process soap making or room temperature soap making and incorporate the following steps. Begin by grating the soap scraps up the day before and laying them out on a tray so they can air dry a little bit. If they are too sticky, they tend to clump and will not mix nicely in the soap base. Combine your white mica and chromium green oxide with a small amount of oil and mix well. Once your soap has reached a thin trace add the colour mixture and stick blend it in well. Add in the essential oils and mix until a medium-thick trace is reached. Fold in the grated soap bits and pour into your prepared soap mould. Insulate the soap as you normally would and let set for 24 to 48 hours.